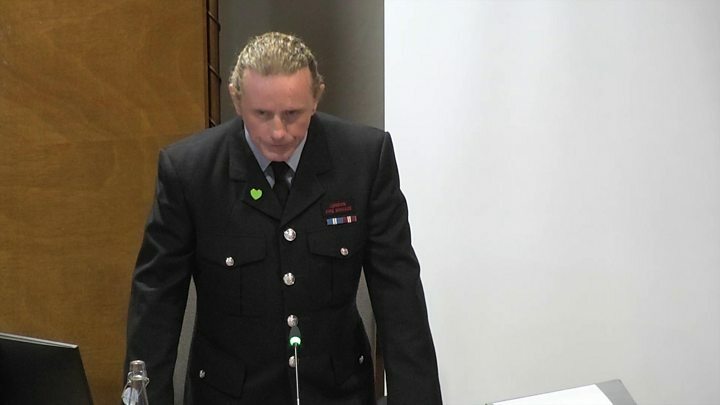 Media captionGrenfell firefighter Desmond Murphy: "I'm sorry we couldn't get your loved ones out"
A firefighter has personally apologised to families of residents on the 14th floor of Grenfell Tower who were told to stay put in the burning building. Desmond Murphy, a Kensington firefighter, told the public inquiry: "I'm very sorry we couldn't get your loved ones out of the building." Four of the eight residents advised to remain in flat 113 died that night. Mr Murphy said: "If I had taken anyone down, it would have led them to a very early death. It was not safe." Giving evidence at the inquiry into last June's fire at Grenfell Tower, Mr Murphy said he had come across Denis Murphy, who eventually died, in flat 111 on the 14th floor. He and his fellow firefighters found him struggling, with soot on his face. "He was conscious and still breathing, he was bent over double and coughing," Mr Murphy said. His flat was filling with smoke and unsafe. As they led him out, two Syrian brothers - Mohammed and Omar al-Haj Ali - emerged from the neighbouring flat. Mr Murphy said: "One was very, very calm - the other one was quite distressed and upset. He said: 'Please don't leave us.'" They were told to take their neighbour into flat 111, which was clear of smoke while the firefighters checked the neighbouring flats. Why was 'stay put' advice so disastrous? In flat 115, they found Zainab Deen and her two-year-old boy, Jeremiah. Ms Deen told Mr Murphy: "Don't leave me on my own." All the 14th floor residents were then moved into flat 113. But the firefighters, who were by now running low on air, had to leave for the lower floors, the inquiry heard. They took a headcount of the six adults and two children in the flat and passed the information on to their superiors. After his evidence, Mr Murphy asked to return to the hearing to make his apology. Trying hard to maintain his composure, he said: "I would just like to say to the family members of Denis Murphy and the family members of the other seven residents I came into contact with on the 14th floor - I'm very sorry we couldn't get your loved ones out of the building." Civil engineering student Mohammed Al-Haj Ali died after becoming separated from Omar as they attempted to escape. An inquest found that he had injuries consistent with falling from a height. Zainab Deen and her son, Jeremiah, also died. In a written statement published by the inquiry, firefighter Murphy described the moments after he finished his shift. "As I sat on the grass looking at the tower, it reminded me of when I worked at the terrorist attack at Edgware Road, I was in a trance. "I had a mix of emotions. "I felt pride and achievement of what we had been able to do on floor 14, but similarly I felt guilt and confusion for not being able to do enough - you question yourself." He wrote he must have stared at the tower for an hour in the dark before taking himself to the toilets in the nearby leisure centre where he was physically sick. "This hasn't happened before; it must have been the emotion of everything going on at that point," he said. In the afternoon, the inquiry heard from Peter Herrera, a firefighter from Lambeth, who was allegedly told to rescue a family of three from the 14th floor, rather than the eight stranded residents. He said that once at the flat, he asked Omar al-Haj Ali whether anyone else was left in the flat and was told: "No, I'm the last one." "I said 'let's go, let's go now, is this everyone?' and I got a 'yes - I'm not going to hang around.'" In a written statement, Mr Herrera said: "I did not search the flat as this man was clear that there was no-one else left in the premises." But Omar al-Haj Ali said Mr Herrera's account was "mistaken" and denied the flat was empty. Mr Herrera insisted he did not "make this up" and closed his evidence saying he was "very, very, very sorry" if anyone thought he had failed them.